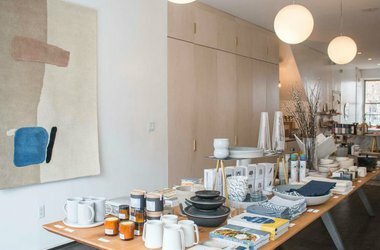 For a taste of LA living, stock up on earthy ceramics, Moon Juice snacks, beauty supplies, expensive and expertly curated tableware, books, and more at this bright and lofty space. All the goods to groom a man into a proper citizen of Williamsburg. Menswear labels hail from London, Paris, and Tokyo; a bookcase of art tomes and vinyl records round things out. A totally bonkers and super funky shop filled with zany crafts and magical trinkets from Mexico. Dia de los Muertos objects, ornaments, and bric-a-brac hang from the rafters. It's a total trip ... that's worth the trip. Drop in for a latte at the coffee counter for a jolt when parsing racks of well-curated mens- and womenswear from up-and-coming designers. The 120-year-old Middle Eastern grocer has provided locals with bulk bin delights (dried apricots, amaranth, molokia), prepared Lebanese foods, cheese, coffee, imported olives, and hard-to-find pantry items. An Eastern-inspired wellness studio, Brooklynified. In addition to yoga, acupuncture, and meditation, you can sign up for offbeat modalities like laugh therapy, sound baths, and sensuality coaching. It's a one-stop shop for all your cosmic needs: moon gatherings, reiki sessions, crystals. Everything a neighborhood bookshop should be: intellectual hub, community gathering space, hang out — this one centered around food and drink. Cookbooks, classes, workshops, recipe chatter, and daily nibbles are on offer. Build your cookbook library or just buy a Sicilan pastry and chat. A truly unique shop with a museum-like quality channeling another era in time. Stunning Victorian rings, early 20th-century furnishings, chandeliers, and items for the curios cabinet are all displayed in a subtle and special way. A bazaar of bohemiam goodies, extraordinary gifts, and curiosities. Walk — in a dream-like state — among Navajo-inspired jewlery, photography, coffee table books, sustainable clothing, and vintage furnishings. A modern paperie with a charming mom-and-pop atmosphere. An array of clever cards, wrapping papers, and gifty things are made by local and small-batch designers. A fresh new approach to the garden center. Succulents, air plants, and unique trees and matched with terrariums, glass orbs, and other interesting planters for the modern home and garden. Where are all the thick-rimmed glasses-wearing intellectuals of Dumbo? Here, catching an avant-garde book reading or observing the latest street art gallery show at this giant warehouse for paper ephemera. Small press and custom published art, fashion, and pop culture tomes are prized. Your coffee table will be thrilled. Shimmy between the stacks and piles of rare art books, unique covers, imported and hard-to-find zines, mags, and journals. Venetian plaster walls and plush upholstery make the tiny tea atelier feel like an oversized jewel box. Teas are sourced from all over the world, and everything, from the teas to the canisters they come in, is custom made. There's always an excellent literary event happening at this bustling shop, which stocks the latest must-reads and a fine selection of cook books, NYC-themed books, and diaries for starting a novel of your own. Old, new, and always representing the latest food trends. Locals try their hand at artisan crafts and food vending (a proven springboard for many a baked goods biz). Go for the records, vintage clothes, people-watching, and food stands. Open seasonally in various locations, like a parking lot, schoolyard, and shipyards waterfront. Check website for details.